Did you know that artichokes came in little purple packages? I didn't. Every time I go to a farmers' market, I try to stick to a few items I know I'll use that week. But every time, I also find one item that I hadn't planned on. Sometimes they're the delicious strawberries I didn't think I needed (and then ended up on the Strawberry & Goat Cheese Pizza not too long after). Other times it's an item I have absolutely never used, but they look too beautiful to pass up. That's the story with these artichokes. I try to hit one of the West LA Farmers' Market on Sunday mornings, but I'm usually too lazy to get out of bed in time to nab the "good stuff." Last Sunday I broke with tradition and forced myself up and out to get to a market relatively early (only 2 hours after it opened!). And that's when I spied the purple chokes. Or chokies, since they're just wee little babies. I walked past them, smiling. I wasn't really interested, even though I've been on a purple veggie kick lately (purple potatoes and purple eggplant...yesterday I even found purple bell peppers!). But a walk back through the same aisle proved too tempting. I gave in and brought them home. Then I scoured the internet to find what to do with them. It turns out that Greg Henry has a wonderful recipe for fried chokies, and it appears about 17 thousand times on the front page of Google. So I took that as a sign that I should make them that way. Trimmed, then pressed and opened, like a flower. He also recommends using a combo of olive and peanut oil. Since I didn't have peanut, but pomace oil has an even higher smoke point, I used it. Plus, I had it on hand. Using a deep fry thermometer is key. I winged it when I made it for my parents, and they didn't have the same crunch factor. For all I know, I was frying them at 300 degrees instead of 360 degrees the entire time. Don't do that to yourself. Get one of these. 1. Trim away a few of the tough outer leaves of each artichoke, Then chop off about 1/3 of the top of the artichoke and trimmed the stem down so that the artichoke will sit flat. Use your fingers to pry and prod the leaves open some. Then invert the artichoke and gently flattened it a bit more using the palm of your hand. Gently is the key word here. They break easy. 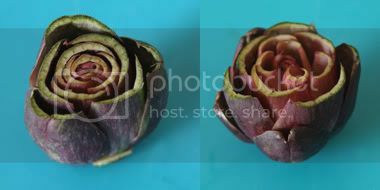 Drop each artichoke in acidulated water until ready to use. 2. The first fry is to blanch only so heat your oil to 300 degree F oil. 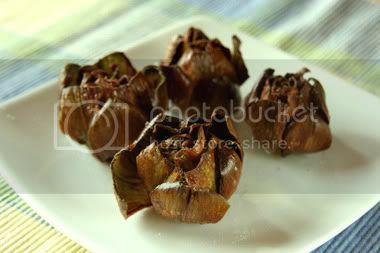 Dry the artichokes off well before continuing. Drop a few at time into the oil for about 2 minutes. Remove them to a paper towel lined plate to drain (upside down). Work in batches so that you do not crowd the fryer. 3. 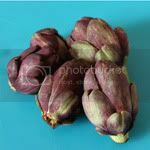 When you are ready to serve the artichokes raise the temperature of the oil to 360 degrees F. They will sizzle and get brown and crunchy quickly; about 2 minutes total frying time should do it. Again, work in batches, and turn them over in the oil a few times while cooking. 4. Drain them well and give them a good sprinkle of excellent salt and a bit of pepper. A little spritz of lemon juice is good too. But you MUST eat them hot to fully enjoy their textures! Mine appear a bit overdone in comparison to Greg's pictures. But they were still tender on the inside, and crispy like potato chips on the outside. I devoured these 4 in no time. One of the many things that goes oh so well with food is alcohol. You can cook with it, drink it while you cook, drink it after you cook, drink it when you're not cooking. Really, the possibilities are endless! We, meaning me, here at G+F love our wine. Any wine really. Red, white, sweet, dry. I'm open to all. Wine's slightly more socially acceptable than our, meaning my, other alcoholic vice, whiskey, which hearkens back to a time when such spirits were prohibited. My family also loves the wine. We have a standing weekly wine & cheese night where we try out new varieties of both. There's a running list of yeas and nays somewhere. And a LOT of discarded corks. So finding Wine Harlots's Put a Cork In It series was a bit of kismet. And now I really want to make this bath mat. We are now saving corks. Chinese eggplant is a fun vegetable. As I mentioned in a previous purple-hued post, they are less bitter than the American eggplant, have a lighter color and thinner skin, and also don't remind me of all those awful eggplant parmesan dishes I've had over the years. It's like there is no other way to cook an eggplant! Thankfully Allrecipes has a fix for that. This hot and sour sauce for Chinese eggplant is delicious. I made it for my parents and served it alongside steak and brown rice. They loved it. The only changes I made to the original recipe were the omission of the chile (not on purpose, it was an oversight), using red chili paste instead of chili oil and the pomace for the vegetable oil, of course. You also don't need to soak the vegetable for a full 30 minutes. 10 minutes and you'll be fine. 1. Place the eggplant cubes into a large bowl, and sprinkle with salt. Fill with enough water to cover, and let stand for 10 minutes. Rinse well, and drain on paper towels. 2. 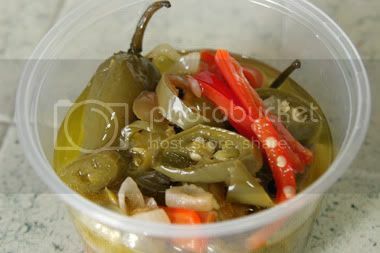 In a small bowl, stir together the soy sauce, red wine vinegar, sugar, chile pepper (if using), cornstarch and chili oil/paste. Set the sauce aside. 3. Heat the vegetable oil in a large skillet or wok over medium-high heat. Fry the eggplant until it is tender and begins to brown, 5 to 10 minutes. 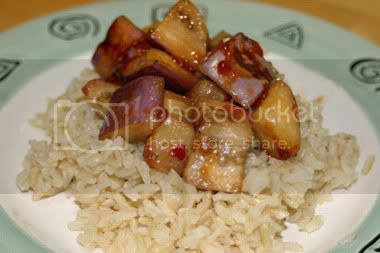 Pour in the sauce, and cook and stir until the sauce is thick and the eggplant is evenly coated. Serve immediately. I like Twitter a lot. I get all kinds of great info about photography, event planning, and, of course, ideas for kitchen experiments from it. At some point, I connected with Melo, a funny and vibrant tweeter who is committed to eating 5 full servings of fruits and vegetables every day. I asked her how she managed this, since this lifestyle would severely cut into my egg roll obsession. What, you didn't know I like egg rolls? Okay yeah, I admit it. Jack in the Box has great fried egg rolls. Yes, I've come to terms with the fact that I'm probably going to die of a heart attack because of this habit. But I am not ashamed! One of these days I'll learn to make them myself. Till then, thank god for Jack in the Box. Nom nom nom. So back to the point: instead of tweeting me back an answer, Melo wrote me an entire blog post. It's awesome. She is, in fact, enabling my obsession. Which I appreciate. All kidding aside, I didn't know this was a movement. The whole reason behind my kitchen experimentation was to become more conscious of what I put in my mouth, so I can totally get behind this. With that, I'd like to thank Melo for turning me on to something new. In your honor, I ate a cutie, watermelon, half an apple, some fennel, and carrots today. Almost 5 full servings. Aren't you proud? I love lamb. I've never met a piece of lamb I didn't want to stuff directly into my mouth. I have friends who find it distasteful, because they think lambs are cute and cuddly. But lambs are not plush toys, there yummy goodness. I've never made lamb myself. And I was in the mood for Moroccan spices, so I picked up a single shank and headed to the kitchen to experiment. 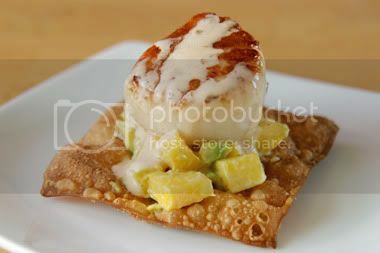 Google research led me to this recipe from the appropriately named Food & Wine Test Kitchen. I followed it almost exactly, except for a few minor substitutions: pomace oil for the olive oil, quinoa for couscous, and a deep cast-iron skillet in place of an enameled casserole. And even though the original recipe calls for 4 shanks and I was only making 1, I didn't mess with the amount of the spices. I certainly didn't want a bland dish. Oh yeah, I also didn't chop the garden-fresh herbs. Not for any good reason, I just didn't. You can though. The recipe looks long and complicated--it really isn't. Don't be overwhelmed by the ingredient list. The recipe is written in order for making the stew, then the quinoa as that is finishing up. I also separated the ingredient list so that it's a little easier to digest. 1. Preheat the oven to 325°. In a deep cast-iron skillet, heat 2 tablespoons of the oil. Season the shank with salt and pepper and brown in the skillet, about 3-4 minutes each side. Transfer to a plate, leaving the fat in the skillet. 2. Add the onion, carrots and garlic and cook over moderate heat, stirring, until lightly browned, about 3 minutes. Add the cumin, coriander, cinnamon, allspice and nutmeg and cook, stirring until lightly toasted, about 1 minute. Add the tomato paste and harissa/chile paste and cook over moderately high heat, stirring, until lightly browned, about 2 minutes. Stir in the wine and boil until reduced to a thick syrup, about 4 minutes. 3. Add the tomatoes and 1 cup of the chicken stock to the skillet. Season with salt and pepper and bring to a boil. Nestle the lamb shank in the liquid. Cover tightly and braise in the oven for about 2 hours, basting occasionally, until the meat is almost falling apart. Transfer the shank to a platter and cover with foil. Leave the oven on. 4. Spread the almonds in a pie pan in an even layer and toast for about 10 minutes, or until golden. 5. Strain the sauce into a bowl, pressing on the vegetables; skim any fat. Return the sauce to the skillet and boil over high heat until reduced to 1 cup, about 10 minutes. Return the vegetables and lamb to the sauce and keep warm. 6. In a small bowl, mix the mint with the cilantro and almonds and season lightly with salt and pepper. 7. Heat 1 tablespoon of pomace oil in a medium saucepan. Add the shallot and cook over moderately high heat until softened, about 2 minutes. Stir in the quinoa and cook until lightly browned, 2 to 3 minutes. 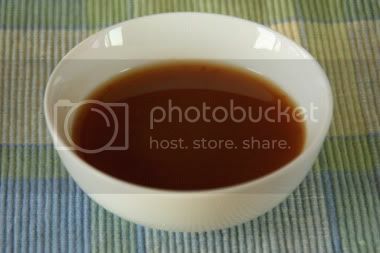 Add the remaining 1 cup of chicken stock, the water and 1/4 teaspoon of salt and bring to a boil. Cover and let simmer until all water has been absorbed (about 10 minutes). Remove from the heat and add the raisins. Cover and let stand for 10 minutes. Fluff with a fork and stir in half of the herb-almond mixture. 8. Mound the quinoa in the center of a platter. 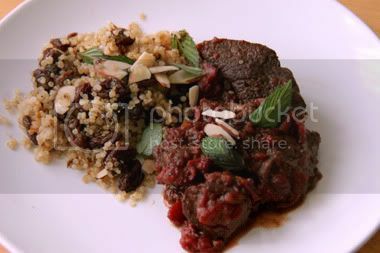 Place the lamb shank next to the quinoa and spoon the sauce on top. Sprinkle with the remaining herb-almond mixture and serve. Who said pesto has to be made a with basil, pine nuts, parmesan and olive oil? 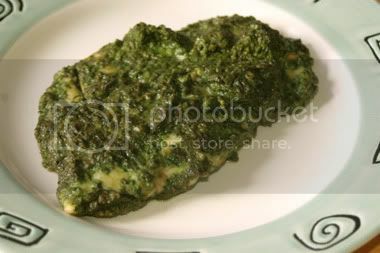 All right, so a "true" pesto follows somewhat along those guidelines. This is not one of those. I've found that every time I buy a bag of greens from the supermarket, I hang on to it a little longer than is worth serving. Instead of throwing it out, I process it together with a few pantry staples and voila: something kind of like pesto! Pat it around a boneless chicken breast and voila: lunch! 1. Throw everything in the food processor and blend on high. Stop after a bit, scrape down the sides, then start up again on low, drizzling the olive oil in as you go. 2. Stop when you get to the consistency of not-quite-yet-mushy-baby food. It should be slightly chunky (like the picture above). 3. Add it to your favorite dish: in pasta, crusted on chicken or fish, as a dip for crackers. Possibilities are endless.